“I’m getting 46 inches here,” said Jan, measuring out the length between where the animal’s foot touched down to where the same foot touched down again. “I got 48 over here,” said Ed, “though it’s still hard to get clear sense of the tracks.” But even without conclusive identification, energy in the group was soaring, knowing a stride of this size could only come from a very large animal. As part of a January 26th tracking class SVC put on in partnership with the Montana Natural History Center (MNHC), Jan and Ed were considering the animal’s gait, or the collection of individual footprints and the pattern they make on a substrate during movement. Just as humans like to walk and snowshoe hares like to bound, each animal has a common, comfortable gait, and others for stressed or lazy times. 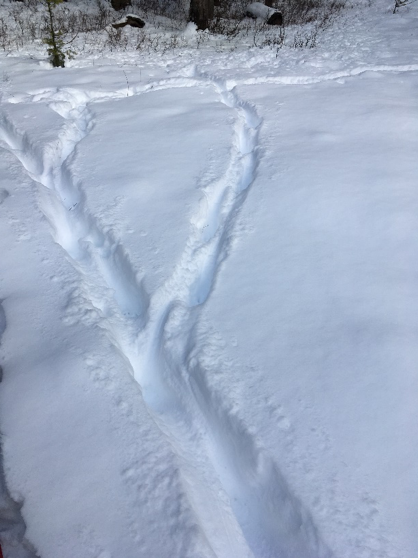 This animal happened to be walking after making a leap up the snowbank on the roadside, and to save energy in the deep snow, it was “directly registering” its hind footprints directly into where its fronts had previously landed. Then, closer to the road where the snow was thin and crisp, a solid track: four toes in a symmetrical oval shape, with claws showing, and HUGE! Ultimately, we decided we were dealing with a wolf. Wolves, actually. Out of one single file track two others fanned out, and there were at least two other trails, too. This is how wildlife tracking happens: you go from considering habitat, to signs of life through habitat, to a variety of intersecting lives. Participants interpret the stride, gait, and tracks from a pack of gray wolves.  There’s nothing like seeing the actual animal, but naming a species isn’t the only goal. It’s just as inspiring to learn by asking questions and observing patterns from signs elusive creatures leave behind. And while it’s infinitely educational and fun, the art of tracking also has practical value. In addition to many years of hunting, Luke draws his own tracking expertise from previous mentors and from monitoring rare forest carnivores in and around the Swan Valley, one of the best strongholds for lynx and wolverines in North America. Before going into the field to test their skills, Luke prepped class participants with images and examples to help stories in the snow come alive. Surprises never cease in this pursuit, and “when in doubt, track it out” is an old SVC quip that Luke is fond of repeating. 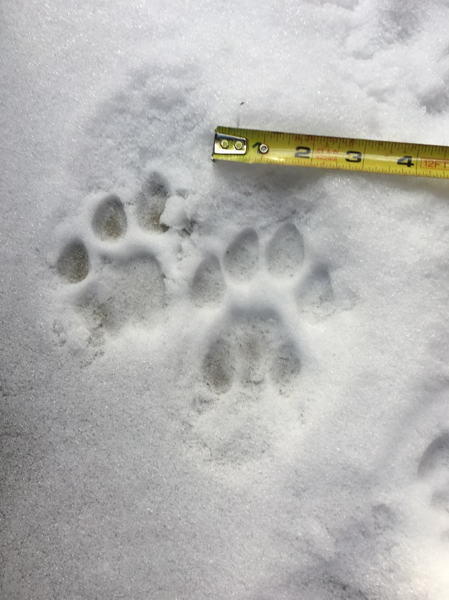 In addition to finding sign of gray wolves, ruffed grouse, short-tailed weasel, red squirrel, whitetail deer, and snowshoe hare, the class found some excellent examples of mountain lion prints – round and asymmetrical, with four toes, no claws, and three distinct lobes on the palm pads. One mountain lion even took a seat right on the pavement of this outhouse! 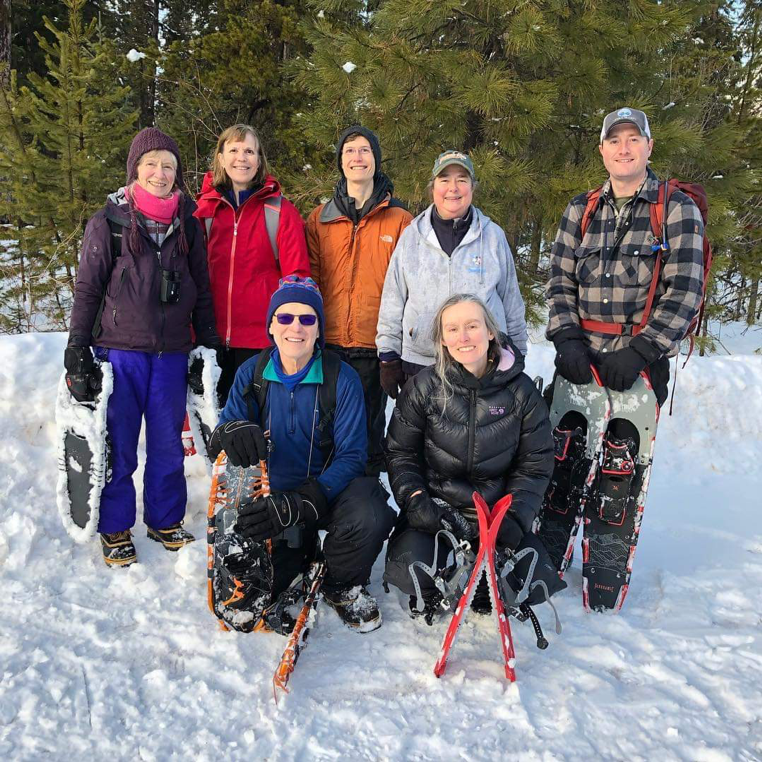 If you’re keen to interpret the stories you’re seeing in the woods, please reserve your space with Field Program Coordinator Lindsay Wancour (lindsay@svconnections.org, 406-754-3137) in SVC’s upcoming Wildlife Tracking classes on March 9 or April 13, our Winter Field Ecology class from March 22-24, or our Master Naturalist certification course from July 11-16. We look forward to seeing you out there!